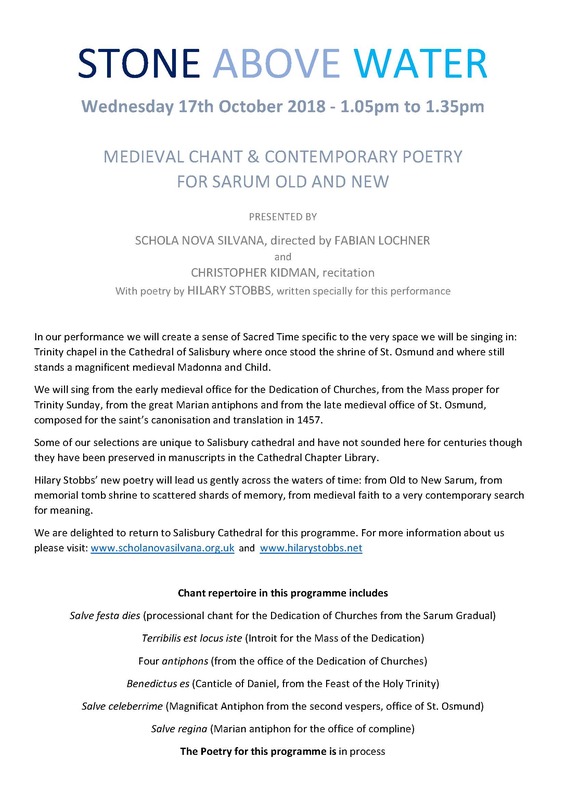 Schola Nova Silvana invited back to Salisbury Cathedral! We were delighted to receive confirmation that Schola Nova Silvana will be performing again at Salisbury Cathedral! On October 17, 2018 at 13:05, we will be singing a 35-minute programme entitled "Music for a Cathedral", as part of the Cathedral's on-going weekday recital programme. 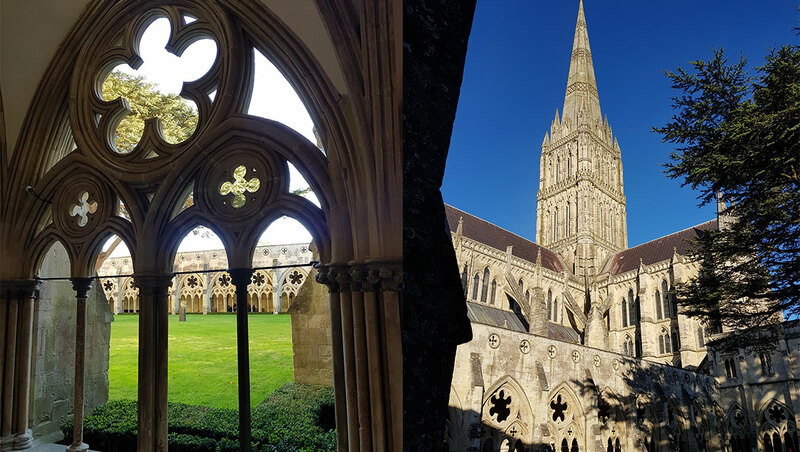 Building on our success at Salisbury last November when we presented chant selections from the feast of St. Michael and All Angels, in this programme we will be honouring Salisbury cathedral, the building itself and its unique medieval chant tradition, the Sarum rite. As the gothic cathedral of New Sarum was dedicated on September 30, 1258 - all of 760 years ago! - we will be singing from the Mass of the Dedication as well as the feast of Michaelmas (Sept 29). As last year, we will be performing in the Trinity chapel, at the East end of the cathedral, behind the High Altar, so our selections will include chants from the feast of the Holy Trinity and for Mary to whom the cathedral is dedicated (this will include the famous Salve regina). Most exciting of all, we will sing excerpts from the 15th-century office of St. Osmund (+1099) whose shrine was formerly located on the very spot where we will be singing. The music for this office is preserved in a manuscript at the Cathedral Chapter library and has probably not been performed since the Reformation. So - mark the date, this will be very special occasion! Schola Nova Silvana is a small mixed-voice, non-professional vocal ensemble dedicated to singing and performing Western medieval plainchant – a vast musical repertoire sung principally in Latin, in unison and without instrumental accompaniment. Through concerts, workshops, recordings and musical pilgrimages we want to share with general audiences the joy and the wonder, the peace and the ecstasy and the sheer beauty of these ancient sacred melodies. Schola Nova Silvana, while not composed of vocal professionals, nonetheless aims for the highest standard of performance. Our director, Fabian Lochner, is a published chant scholar whose long experience in university research gives our group unique access to valuable historical information on this specialized repertoire. We also aim, through our activities, to help raise funds for the restoration or maintenance of resonant historic buildings (parish churches, abbeys, cathedrals) that were intended originally for the singing of plainchant. As a secular choir, we are not affiliated with any religion. Our members are from different religions or none. While we are all passionate about creating a sacred or meditative mood in our singing, we do not sing for worship. Singing in religious services is therefore not part of our mission. Schola Nova Silvana is proud to be associated with prize-winning poet Hilary Stobbs who is writing a series of original poems intended for live recitation during our concerts. We are also proud to count as our member an accomplished poetry recitalist, Christopher Kidman, former member of the faculty of the Camphill Eurythmy School in Ringwood and Botton. Christopher will introduce and recite the poetry of Hilary Stobbs as well as other selected pieces. Our director, Fabian Lochner, is an associate member of Amra, an organization dedicated to the promotion of plainchant for Irish saints found in manuscripts in Ireland, Britain and continental Europe. Fabian has been invited to teach chant workshops in Ireland in collaboration with the founder and director of Amra, Professor Ann Buckley (Trinity College Dublin).